"A pleasing coin fully of this grade if not stronger. Unclipped on a planchet that is closer to round than many. Struck slightly low on obverse with some weakness at lower legend resulting, but the rest of the legends are bold. 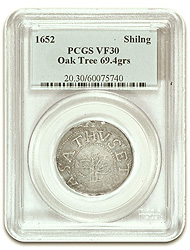 Tree shows ample detail for these dies, which typically are not strong at obverse center. Attractive medium silver toning, problem free other than a small toned obverse scratch." "An attractive example of this American classic. Problem free and full weight, this coin too is struck on a remarkably round planchet, which cannot be taken for granted with these issues. Centers on both sides." 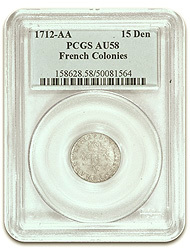 "Arguably one of the most significant French Colonial coins, and one that firmly belongs in any colonial collection. 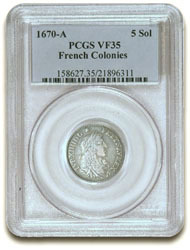 Unlike most coins included in the French Colonial series which also saw usage in varied French Colonies and/or France itself, these were exclusively minted for North American use. 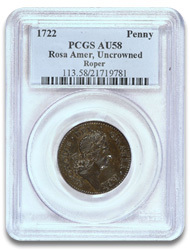 Scarce in any grade and under appreciated by most guide books and most collectors, these seldom become available and rarely are they found in a higher grade than this coin. Natural light silver toning on the high points with deepening gray in the fields. Well centered and struck and fully of this grade or possibly higher. Problem free save for the most trivial of marks on the reverse only. Well above average and highly desirable as such. " "Few collectors appreciate how difficult it is to find this issue in a condition anywhere approaching that of this example. While Sou Marqees, the much more commonly encountered French Billon coinage, can with some effort be found in lovely high end grades, that does not carry over to these small 15 Deniers coins which, when found at all, are almost always found in lower and middle grades. 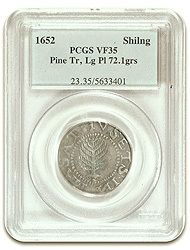 On this coin, the silvering is virtually intact and displays ample flash. Problem free other than some faint natural roughness present in the planchet as made. An interesting die cud is visible at the upper right of the reverse. Another coin which would be extremely hard to improve on. " "Type with No Stop After X. 1722 Rosa Twopences are considerably scarcer than 1723 issues and much more difficult to obtain in any grade remotely approaching Uncirculated. Further, only a small minority of 1722 Rosa twopences do not have a period after X. It would be virtually impossible to improve upon this piece. Both the Norweb and Ford Collections contained just a single example of this underappreciated type, with this being the Norweb coin. Toned an even medium to dark olive brown and free of all distracting marks, aside from one or two micro voids at the rims. This rare and important coin is the Breen Plate Coin. ex. Norweb Collection. ex. Bowers & Merena 03/88 Lot #2413. " The type with No Stop After X. Almost completely toned a dark golden brown but with a touch of brighter Bath Metal gold showing through at AM of the reverse legend. Glossy and problem free with surfaces that are a bit smoother than normally encountered for this issue.